Last week we had a look at the teams in the East division, and where each one may look to improve in the off-season. Now we’ll look at the West division. It’s hard to look at a team like the Roughnecks and figure out where they need to get better. Offense? Second-most goals scored in the league, behind the Mammoth by one. Defense? Lowest goals against in the league by five over the Rush and twenty over the Swarm. Goaltender? 2012 NLL Goaltender of the Year should be good enough. Coaching? 2012 IL Indoor Coach of the Year and runner-up for the Les Bartley Award. As long as they can avoid playing Edmonton in the first round of the playoffs, the Roughnecks should be OK for next year even if they make no changes at all. 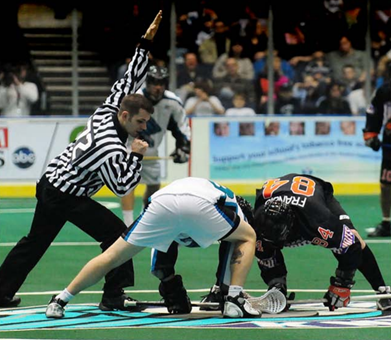 Similar to the Roughnecks, the Mammoth are strong on offense, defense, and goaltending. John Grant is unlikely to repeat his 2012 MVP performance next year, but even a pretty good Junior is better than most of the league. There were a bunch of rookies on the Mammoth this season, all of whom benefited from having Grant around. Jones and Hopcroft and Lincoln and McBride all learned a ton from Grant during his best season and will be better players next year because of it. They will likely be able to pick up the slack even if Junior’s numbers do drop. And even if they don’t, the Mammoth scored more goals than anyone else last year – if they’d scored nineteen fewer goals, they’d still be tied for third. The Mammoth defense wasn’t as great in 2012 as it was in 2011 – in fact, they were sixth in the league in goals against, and only had two games all year where they gave up less than 10 goals. But they were without defensive stud Mac Allen for most of the season, so having him return was huge. Still, the Mammoth gave up 13 or more goals in 7 of their 16 games; if it wasn’t for their outstanding offense, they wouldn’t have ended up with 11 wins. I don’t see the Mammoth making any goaltending changes and they certainly don’t need a defensive overhaul, but a bit of an offense-for-defense trade wouldn’t surprise me. Things are looking great for the Rush’s future. Not only did they make it to the finals, but they have a few first-round draft picks coming their way over the next couple of years from Philly and Washington, including first overall in the next entry draft. Welcome to Edmonton, Mark Matthews. On top of that, they have some trade bait in Paul Rabil and Scott Evans. Although according to Stephen Stamp’s article on IL Indoor, Evans is talking about working out and getting into better shape, and if he can do that and conform a little more to the Rush’s game plan, he may fit into their offense after all. That plus the addition of Matthews (I’m making an assumption here, as is everyone else, that Matthews is the guy they’ll pick) could be the offensive spark the Rush need. They seemed to find that spark in the playoffs, but could have used about a half-game more of it. Shawn Williams is a free agent – will he want to continue travelling west next season? I’m sure he wouldn’t mind returning to his hometown Rock, but they are already kind of full on the left side with Doyle, Sanderson, and Leblanc. Could he return to the Knighthawks? They just won a Championship without him, so unless he’s part of a package that includes younger players or draft picks, I don’t see Rochester pulling the strings on that deal. The Bandits need to get younger, so that wouldn’t make sense either. If I had to guess though, I see him going back to the Rush since they got so close to a Championship, and the team is likely to be even better next year. The Swarm have a young team with tremendous potential, and they also have four first round picks in this year’s entry draft. In three or four years, those guys will have a few seasons under their belts, the current group will really be just entering their prime (how scary a thought is that? ), and even vets like Benesch and Crawford are young enough that they’ll still be in their prime. This could be a scary good team for a while. Remember how dominant Calgary and Colorado were in 2012? Wait a few seasons, and we might have Edmonton and Minnesota in that situation, and we’ll be talking about the “aging” Roughnecks. Unless they make big changes before then, the Bandits will be sponsored by Ensure. The biggest issue the Swarm may face is the infamous sophomore slump – if that hits more than one player, they may have a problem. But then again, in recent years Andrew Suitor, Kyle Rubisch, Cody Jamieson, Stephen Leblanc, and Curtis Dickson have all had pretty decent second seasons. I don’t think there’s a single area of concern for the Swarm – third in goals scored, third in goals against, an outstanding goalie tandem, and two of the best transition players in the league in Suitor and MacIntosh. But if the Swarm decide they do need to make some changes, they have a ton of draft picks to fill in the holes, or they could trade one away. A high first-round draft pick will net you a better-than-decent player, and being left with “only” three first-rounders is still pretty good. This is a tough one. On paper, the Stealth shouldn’t need to make huge changes but after missing the playoffs, they have to do something. Obviously players like Duch, Ratcliff, and Iannucci aren’t going anywhere. On the back end, Sorensen and Captain Bloom are locks, and apparently the Stealth refused to part with Jeff Moleski for Iannucci, so he’s likely staying. Tyler Richards didn’t have the greatest season ever, considering he was 3-9 with a GAA well over 12, but he was also injured for part of the year. How much of that record was his fault vs. the defense in front of him I can’t say, since I didn’t see many Stealth games (and the ones I did see were generally late at night so I was sleepy). But Richards did pick up a few IL Indoor Goaltender of the Year votes, so we’ll assume the Stealth agrees and won’t be dealing him. The Stealth have the pieces, so I don’t see them making huge roster changes or going into rebuilding mode. There will be a few moves here and there, maybe even a blockbuster to shake things up. But it wouldn’t surprise me if the 2013 Stealth isn’t significantly different from the 2012 Stealth. Unlike the Bandits, perhaps the Stealth’s strategy will be “Hope everyone plays better”. But if they have another season like this one, nobody’s job will be safe. Now that the 2012 season is behind us, each team will be looking to 2013 and trying to decide what changes need to be made. Let’s look over each team and see what changes may be in store. We’ll start with the East division, and get to the West in a few days. There will be lots of changes coming for the Bandits this offseason, if you believe what Darris Kilgour said a number of times during the season. I don’t know how much of that was said in the heat of the moment, but I don’t imagine his strategy for 2013 will be “Hope everyone plays better”. Goaltending is not a problem assuming Cosmo stays in Buffalo, and I have no reason to believe he won’t. As good as John Tavares was this year, surely he has to slow down sometime, doesn’t he? Maybe, but I’ve been asking that question for five years. Tracey Kelusky has said that he was pretty unhappy with his own play in the 2011 season, and his point total dropped by half in 2012. Considering the impact he’s had on the league over the last ten years, it would be kind of sad to see a sure-fire hall-of-famer like TK retire after two such lacklustre seasons, but I’m not sure I can see the Bandits taking another chance on him. In a nutshell, the Bandits need to get younger – though ironically, the Bandit least likely to be traded is 43-year-old John Tavares. They have one first round pick (third overall) in the next entry draft thanks to the Chris Corbeil trade, but their own pick – second overall – was sent to Minnesota for Anthony Cosmo. Their first round pick next year belongs to the Swarm as well. I’d look for a number of players to be moved out for draft picks. I’m not sure what to think about the Wings. They had periods where they played really well, and periods where they played really badly. Their defense played well against the Rock in Toronto, allowing 8 and 10 goals in two games, and then allowed 13 or more in five of six straight games (and 12 in the sixth). They were in first place in mid-March and then collapsed, losing their last five. Dan Dawson was obviously not the problem here. Dawson had yet another great season, but in the NLL one player cannot pull a LeBron and lift a team to greatness pretty much by himself. A quick glance at the individual numbers seemed fine, with Dawson over 100 points and Crowley, Mundorf, Westervelt, and Hominuck all over 50. By comparison, the champion Knighthawks only had four players over 50 points, and the Bandits only had three. But after that, things drop off significantly. Brodie Merrill had 32 points, and Siebald and Crotty had 14 each. Nobody else had more than 8. Of their nine losses, they scored fewer than ten goals in five of them (and exactly ten in two more). Only the Edmonton Rush scored fewer goals than the Wings. And nobody gave up more goals than the Wings. It seemed that for the most part, when the defense had a bad night, they had a bad night. The Wings gave up 15 or more goals six times, though they won one of those six. This seems odd considering there were people voting for both Merrill and Paul Dawson for Defensive Player of the Year. Brandon Miller didn’t have his best season ever, and yet Kurtis Wagar and Steve Fryer played only 71 minutes combined all season. The decade-long rebuild of the Wings continues. I’m sure Dawson isn’t going anywhere, nor are Crowley or Merrill. But you gotta wonder if anyone else’s job is safe. Considering the Wings don’t have any first round draft picks for the next couple of years, their best hope for improvement is through trades and free agency. They made a big move last off-season to bring in Merrill, and then had Crowley and Dawson dropped in their laps. I’ve thought all along that Philadelphia would be a good fit for Paul Rabil (can you imagine transition studs Rabil and Merrill on one team?) so it wouldn’t surprise me to see another big trade with Edmonton this off-season. Perhaps the Wings should start looking into what players on their team might consider playing out west. Interestingly, Kevin Crowley is from BC. 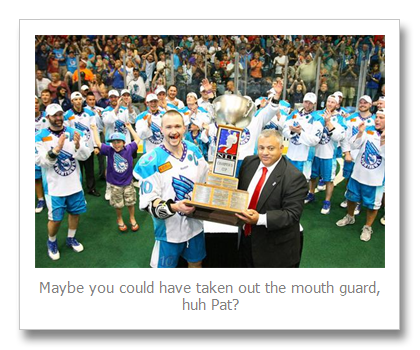 They won the damned championship, so the Knighthawks obviously don’t need an overhaul. They have a mix of young and veteran talent up front, lots of veterans and a couple of kids on D, and an outstanding goalie with many good playing years in front of him. So what are they in desperate need of? Nothing. What could they use? My only thought here might be to get a little younger on the defense. It’s not like their defense is old and creaky, but McCready, Laverty, and Cousins have all been around for a while, and they also have Campbell, Travis Hill, Smith, and Glaves. The only real young players on the D are Dylan Evans, Tyler Burton, and Mike Kirk. But I don’t think this is a huge hole that really needs filling. If someone offers the Knighthawks a trade, that may be where they want to focus, but if they do nothing at all, Rochester will be poised for more successful seasons to come. Jamie Dawick said that Nick Rose is their goalie of the future, though Dawick also had nothing but good things to say about Matt Roik – right up until he was released. That said, I’d be surprised if Rose wasn’t the starting goalie for the Rock in 2013. It has been implied that Pat Campbell may hang ’em up, in which case the Rock need a new backup goaltender. Dawick also said that Phil Sanderson may have to retire after the concussion he suffered this season. That would be a huge loss for the D.
The offense looks set, except for one position where there was a bit of a problem. That would be the “Stephen Leblanc” position. The guy playing there had some good nights, but wasn’t nearly as effective overall as in 2010 or 2011, so that needs to improve. Dan Carey didn’t have a huge impact on the offense but like Flip, he suffered a season-ending concussion. Seeing as this was the second time in his career he’s missed significant time because of a concussion, Carey may have to walk away as well. I think they could use a little more size and toughness from their defense. Considering the firepower up front, could the Rock send one of their O guys off for a big D guy and backup goalie? Doyle and Sanderson aren’t going anywhere, and they’re not likely to trade Billings after the season he just had. Could one of Manning, Leblanc or Beirnes be on their way out? Or will the Rock look to the free agent market to shore up the back end? Congratulations to the Rochester Knighthawks, your 2012 NLL Champions. In the lowest scoring Championship game since… last year [OK, that may not have had the impact I was going for], the Knighthawks came back from a one-goal first half and a 5-1 halftime deficit to outscore the Edmonton Rush 8-1 in the second half and win 9-6. Matt Vinc was outstanding in the first half, keeping the Knighthawks in the game when it could have turned into another blowout like last week’s Western final in Minnesota. He was even better in the second half and in my opinion, deserved to be named game MVP. Instead, that honour went to Cody Jamieson, and I can’t honestly say that Jamieson wasn’t also deserving. He had four goals and four assists, including the first and last goals of the game as well as the game-tying goal. He also had assists on the go-ahead goal and the game winning goal. Zack Greer led the way for the Rush with 2+2 but despite outshooting the Knighthawks 52-35, the Rush just couldn’t solve Vinc. Aaron Bold also had a strong night in the Edmonton net, holding the Knighthawks scoreless in the first quarter and only allowing a single goal in the first half. There was talk on Twitter about how bad the commentary was on the CBS broadcast – Casey Powell remarking about the ten-second rule being over too quickly – but I was watching the game with friends and we were yapping far too much to hear anything from the broadcast. I thought it was really weird that Powell was a hold-out from the Knighthawks (though he wondered if he’d be getting a ring since he’s on the roster) and yet is doing the commentary on the Championship game involving the Knighthawks. Was Paul Rabil not available? I loved the picture posted by Paul Stewart of Shawn Williams remaining on the floor to watch the Cup presentation ceremony, the only member of the Rush still there. As someone who played in Rochester for ten years, Willy knew how much this victory meant to the organization as well as the Knighthawks fans. Losing that game after looking so dominant in the first half must have been extra painful, so it was a classy move to remain to watch the ceremony. So thus ends the 2012 NLL season. The Knighthawks took an improbable road to the Championship by losing three of their first four, and at the half-way point of the season they were 3-5 and third in the East. But they came through in the second half of the season – or did they? Not really. They lost four of their last six and ended up with a losing 7-9 record, but finishing second in the east thanks to similarly lousy seasons by Buffalo and Philadelphia. Give the Knighthawks credit where it’s due though – they came alive in the playoffs, taking out the Wings despite being outscored 7-2 in the fourth, then dominating the Rock in Toronto, and then coming back from a single-goal first half against the Rush. The Rush had a similarly rough regular season, starting 2-7 and looking like they might be the lone team left out of the playoffs. But they finished the season 4-3, including wins over the Swarm and the Mammoth. And then came the playoffs. The offense that had been lacking all season long exploded for 19 goals against Calgary – the best defense in the league – and then 15 against Minnesota. They went into the Championship game as the hottest team in the league, and for half the game, that continued. But they seemed to run out of gas after that, and the Knighthawks took advantage. The Rush should be very proud of their playoff run, and considering their first-overall draft pick, they could be pretty good for years to come. It was an exciting season, to be sure – the parity we expected at the beginning of the year was definitely a huge factor. The whole cliché about any team being able to beat any other team on any given night was true, and yet we didn’t have all nine teams at or near .500, especially in the west. Congrats again to the NLL Champion Knighthawks. After going 2-2 in the first round, I completely blew the division finals, going 0-2. So it comes down to yet another difficult pick – Edmonton or Rochester. Edmonton is hot right now, winning two games they weren’t expected to win. Their goalie and defense, which have been great all year, are still great but the offense is the surprising part. It’s only been two games, but after averaging a league-low 10.4 goals per game in the regular season, the Rush are averaging 17 in the playoffs. Can they keep it up for one more game? Rochester has the best of both worlds – lots of young players like Jamieson, Keogh, and Powless as well as veterans like Vinc (has he really played seven seasons? I still think of him as one of the new goalies on the block), Accursi, McCready, and Cousins. They had an inconsistent season, with two separate three-game losing streaks, but played very well against both Philadelphia and Toronto to earn their way to the Big Game. Can they keep it up for one more game? I have to take the hot team here. We’ve known their defense and goaltending was excellent since the beginning of the year, and I had a feeling (and I know others did as well) that their offense was better than they were showing. The Knighthawks have Matt Vinc who can certainly steal a game, and Johnny Powless is quickly turning into one of the most exciting players in the game, but Shawn Williams, Steve Toll, and Aaron Bold are all former Knighthawks, and I’m sure they’d love to win a Championship against their former team. (Scott Evans too, but he’s likely to be on the bench.) This may be Steve Toll’s last NLL season, so his teammates would love to send him off with a Championship. 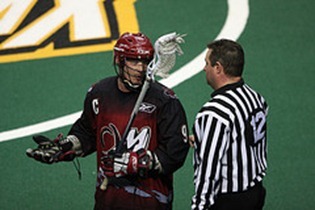 This is the second of my two-part series on referees in the NLL. In part one, we talked about how referees have a thankless and difficult job. In addition to that, they have fans constantly complaining about the penalties they call or don’t call. Can they be inconsistent? Absolutely, but who isn’t? Do they make mistakes? Definitely, but who doesn’t? It seems that fans will not accept even the slightest error by an official. When was the last time you heard a fan say “Yeah, that was the wrong call, but hey, he’s only human”? One of the biggest complaints about refs is that they are inconsistent, and I completely agree that this is a problem. Inconsistency can be a big problem in any sport, but honestly, I’ve never noticed NLL refs being any more inconsistent than officials in other sports. We’ve all seen an umpire that calls a high pitch a strike in the second inning and a ball in the seventh, but nobody pulls the old “All MLB umpires are incompetent and they should all be fired.” You also have to remember that there are two refs, so when they called Mr. Goon on your team for the hit from behind in the first quarter and then didn’t call Mr. 40-goal-scorer on the other team for a similar hit in the third, it may not have been the same ref. The one that called the first penalty may have been fifty feet away from the second, and the one that saw the second hit may not have seen the first and thought the second wasn’t a hit worth penalizing. Two different fans may disagree on what constitutes a clean hit from a dirty one, why wouldn’t two refs? Another charge leveled at the refs is that they’re biased. Few, if any, refs in lacrosse can be completely unbiased. This is because very few people can be completely unbiased. The only way to make sure you have truly unbiased refs is to have people who DO NOT CARE who wins or loses, which means you need someone who doesn’t know the players or coaches personally, and has no history with any of them or any of the teams. But lacrosse is such a small community that this is pretty much impossible. People can overlook their personal relationships with players and I’m sure most officials in all sports do, but even so, the perception of bias will be there. Say a ref calls a crosschecking penalty against one player and ten minutes later does not call a penalty against another player for a similar hit. But if the ref and one of the players involved know each other from junior lacrosse or come from the same town or something, fans may believe that he has a bias against the first player or is a friend of the second. In actual fact, it could be that the ref just didn’t see the second hit, or from his vantage point the second hit was similar but clean. There’s pretty much no way around this. People are going to believe what they believe, sometimes in spite of the evidence. Refs are just going to have thick skins when it comes to fans accusing them of bias. And considering that in general the fans are actively rooting for one team over the other, having them accuse someone else of bias is just a touch ironic. But some people go even further than that, and make accusations that the refs, or the league as a whole, have it out for a particular team or want a particular team to be successful. There is a huge difference between having inconsistent or biased refs and an organized conspiracy. Bias can be explicit – “I don’t like this guy so if he hits someone and and it’s even close to being illegal, I’m going to call a penalty on him” – or implicit, where a ref may call a penalty against a player because he has a history of bad behaviour, and so he’s not given the benefit of the doubt even if this decision isn’t conscious. The former needs to be eliminated, if it can be detected, but there’s not much that can be done about the latter. A conspiracy, on the other hand, implies knowingly applying the rules and making judgment calls differently based on the team or player that the potential infraction is against. It would also mean that more than one ref must be involved in this, since a single ref consistently calling penalties against one team and not the other would be noticed (and likely questioned) by the other ref if he weren’t in on it. This kind of accusation is serious, and would call into question every game the refs being accused have ever worked. If such an accusation could be proven – that one or more refs conspired to penalize one team more or less heavily than the others – this would be the biggest scandal the league has ever seen. If it could be proven that the league itself was involved, it’s safe to say the NLL would finally be getting the front-page coverage they’ve been seeking for years – right before they fold. Sure, having a Colorado / Toronto final would be better for ratings and publicity than an Edmonton / Rochester final, but the risks to the league of trying to arrange something like this are just too great for such a scheme to even be considered. We have to assume that the league and refs are impartial (or as impartial as possible) and that any claim otherwise is infeasible. You’d need extraordinary evidence in order to make a case for such an extraordinary claim. I’ve heard many such claims but have never seen the slightest shred of actual evidence. Many people reading these articles will simply brush me off as an NLL ref apologist. Some might wonder if I have a friend or relative who’s a ref. For the record, I don’t. And there is at least one NLL ref who I don’t particularly like. I find he tends to make a big show of some calls, as if he wants it to be about him, making sure everyone knows that he is in charge. As I said before, the best refs are the ones who do their job and fade into the background, not getting in the way unless it’s necessary. Now I will admit that I may be totally off-base with some of this. Maybe I’ve been lucky and the refs I’ve seen are pretty good while the ones that play Philly and Rochester and out west aren’t as good. It’s possible that never having actually played lacrosse, I just don’t know bad reffing when I see it. Or maybe the overall talent level is not high but is fairly consistent, and I’m confusing that with “they’re all pretty good”. Yes, there are always going to be bad calls by refs in lacrosse games. But if you don’t give in to confirmation bias, I suspect that in the long run you’ll find that just as many bad calls go against your team as against the other teams. This means that there is indeed a level playing field and so any biases, real or perceived, are eventually cancelled out. NLL games are decided by the players, not the refs.